Most Mustangs equipped with a 428 Cobra Jet or Super Cobra Jet engine and power steering were also equipped with a power steering fluid cooler. The service part number for this cooler is C8OZ-3D746-A. This same cooler was used on Torinos and Fairlanes equipped with 428 CJ and SCJ engines, and also 1969 and 1970 Boss 429s, but it's not the same cooler as was used on Boss 302s. 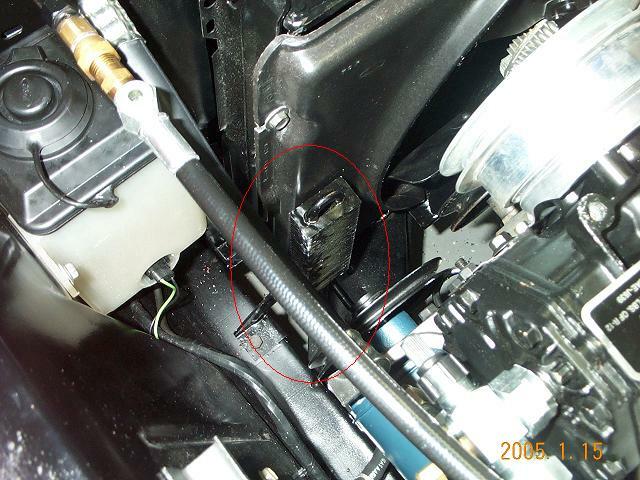 The cooler has a engineering number of C8OA-3D746-A (circled in red in the picture below) stamped in a semi-circle on the top of the mounting bracket used to secure the cooler to the driver's side front frame rail. 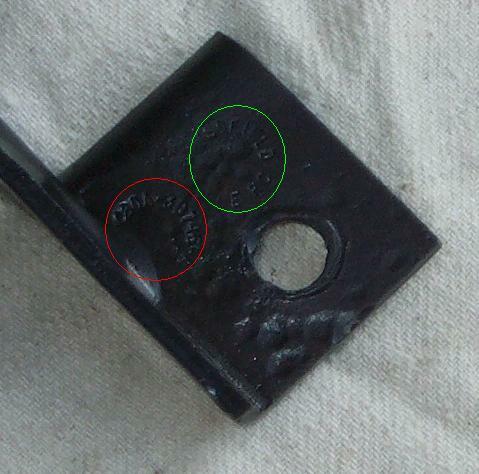 At least one cooler I've seen also has "BLISSFIELD PERC" stamped (circled in green below) in a circle on the bracket next to the engineering number; could this be some sort of manufacturer identification? A 1968 Lincoln-Mercury Technical Service Bulletin (TSB) dated 21 October 1968 describes how to retrofit the power steering fluid cooler assembly on 1968 and 1969 vehicles assembled before 20 June 1968. The bulletin includes helpful installation instructions and pictures. Thanks to Gord Howard for sharing a copy of the Lincoln-Mercury TSB (we're still looking for the Ford version). The cooler mounts to the upper surface of the front driver's side frame rail approximately 11 - 11.25" in front of the shock tower. 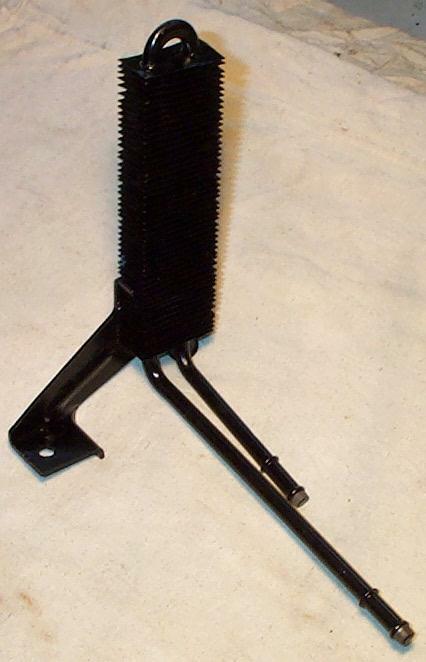 A self-tapping screw, part number 378459-S2 (5/16"-18 x 5/8") finished in phosphate and oil, was used to secure the cooler to the frame rail. The return hose, part number C7AZ-3A005-A, is cut to length so that fluid runs from the lower return hose, through the cooler, and then up to the pump. Band clamps (with the heads facing down) are used to secure the hoses to the cooler.